While the evening light offered some photo opportunities, it had been a long day and we were happy to turn in early. The next morning dawned sunny but cool with a heavy dew, and I set off for a quiet wander back downstream with camera in hand. Almost immediately I encountered a rather unusual subject – a large native dragonfly that had parked up for the night on a red tussock, and which was now immobilised by the cold and covered in heavy dew. I’d decided on this trip to leave my heavy macro lens behind, and was carrying just a pair of Nikkor two-element close-up filters – a 3T and 4T – which I find excellent on a prime lens. The 3T was more than equal to the task. Wandering further downstream I encountered a range of opportunities, enjoying the soft morning light with its superb ability to illuminate the varied patterns of the river and its flats. Eventually I turned back – I’d promised not to stay away too long – and we packed up and headed off up the valley towards Fenella Hut, one of the most creatively constructed huts I’ve ever stayed in. It was lovingly built in memory of a young New Zealand climber killed in a tragic accident in the Southern Alps – the toilet (built by friend and colleague Geoff Rogers) reflects a complex mix of engineering skill and artistry with its stained-glass windows and continuously running hand-wash. The walk up valley was pleasant, although our fitness was yet to fully kick in – we climbed a series of glacial steps interspersed with gentler sections, and more interesting bits of history in the historic Chaffey’s hut and an old Forest Service tent camp. 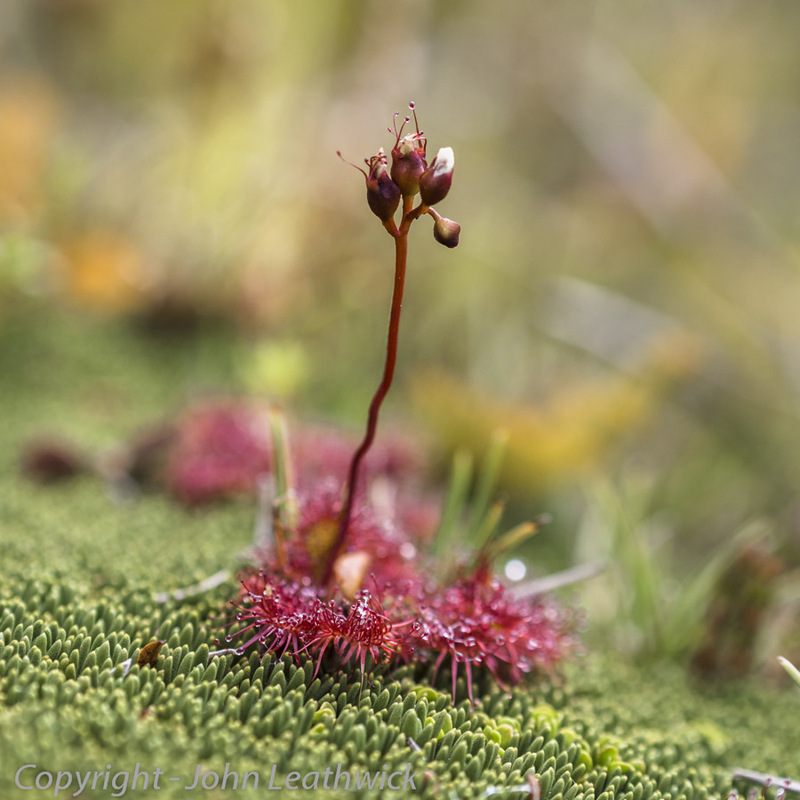 Once at Fenella, we headed for the swimming tarn on the saddle between the Cobb and Bergoo Rivers – a small lake, reputedly warmed by the sun, but I was more interested in photographing the diversity of bog plants and insects, so didn’t test its temperature. Day three was wet – a day to kick back, relax, and enjoy the peace and quiet, browsing a backlog of Guardian Weeklys and assorted hut literature, and chatting with other hut occupants, including a French chocalateur who had strayed a long way from his kitchen! Day four also started off wet, but the rain then turned to snow, continuing until late morning and creating a veritable fairy land in the mountain beech forest surrounding the hut. The afternoon brought clearing weather and after donning suitable gear we headed up the track to Mount Gibbs via Xenicus basin. The snow went quickly, but it was easy to see how harsh the climate can be in New Zealand’s alpine environments – even in mid-summer. We stayed out for nearly 6 hours, enjoying the interplay of light and landscape as the cloud steadily cleared. Views off the high ridges were spectacular, particularly looking southwest into the head of the Roaring Lion and north to the Dragon’s Teeth. Looking southwest from Mount Gibbs into the Roaring Lion, a tributary of the Karamea River. More photos from this trip can be found here. 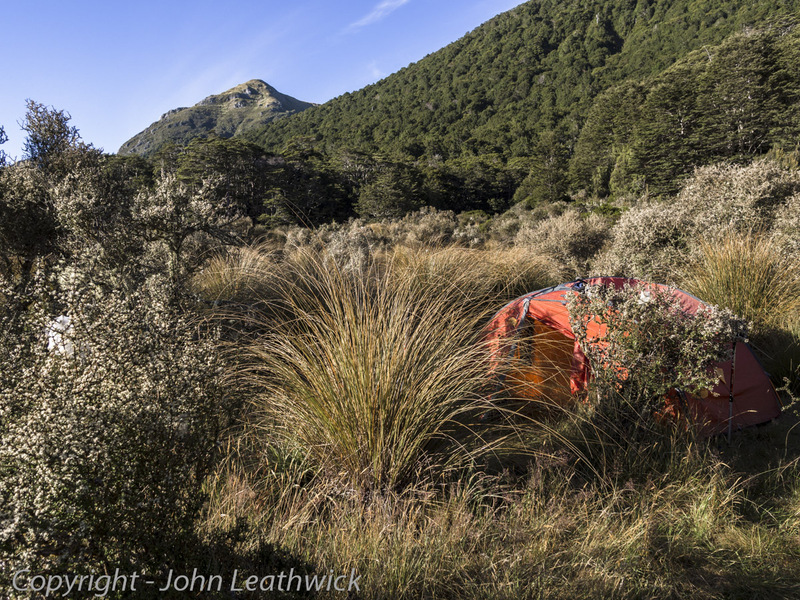 In part two I’ll describe the trip out along the Lockett Range – a barely marked route through steep terrain! Inspiring and evocative photos! I’ve tramped most of my life but still haven’t made it to the Cobb Valley so your photos have reminded me that I must get there soon – thanks for sharing these gems.